Enlightenment and spiritual awakening in simple, clear English with Thomas Razzeto. - Thomas Razzeto from his book, Living the Paradox of Enlightenment. • The awareness that is looking out of your eyes is the same awareness that is looking out of my eyes and the eyes of every sentient being. There is only One Awareness. Your fundamental identity is Source-Awareness, the one, uncreated, formless Divine Essence. Your nonfundamental identity is the totality of created reality. This is what you are through the process of creation. And your functional identity is the person you appear to be. All of creation is thoroughly divine since God is not merely infinitely intimate with all of creation, God is creation. Since your core beliefs are at the beginning of this creative process, all effective change will start here. If you desire a more joyous state of being, you must drop the core beliefs that are preventing this joy from arising and adopt beliefs that allow you to be happy right now. Then you will take wholesome action that corresponds to these new beliefs. This is how you love yourself without being selfish. Once you understand that your outer circumstances are just a reflection, you will stop trying to manipulate them directly. So the universe is not your personal mail order catalog simply waiting for you to clearly make up your mind and place your order as some people have claimed. This is not about creating specific outer circumstances so that you can then become happy. If you are not happy most of the time, then you must first change the core beliefs that are preventing you from being happy right now. The word “nondual” means “not two” and we use it because God and creation are One Reality, not two. This wisdom holds that the unseen Creator arises as the world we see all around us. This is like an actor arising as a character. There is a difference between the actor and the character since the actor is the source of the character. It’s not the other way around, the character is not the source of the actor. Furthermore, the character cannot go on the stage without the actor. And yet, the actor can drop the role of the character at any time. Because of this, it is wise to make a distinction between the transcendent source (the actor) and the dependent construction (the character). And yet when the actor comes forward as the character, they are one. Every single quality or aspect of the character is truly a quality or aspect that is being exhibited by the actor, and every single action that appears to be done by the character is really done by the actor. What appears to be the will and power of the character are really the will and power of the actor. If you are standing in front of the character and you want to find the actor, you do not need to dig into a deeper and deeper layer. No. When you look into the eyes of the character, you are looking directly into the eyes of the actor. They are one. A similar thing is happening with God and creation. It is God (the One Invisible Actor) who is arising as everyOne, and it is God who is doing everything spontaneously without a script. Here's the 3-page book excerpt: Why Do We Call It Nondual Wisdom? 2) Being completely free from all selfish or self-centered desires and tendencies. These two aspects work together to automatically produce the unhindered flow of all the divine virtues such as loving kindness, compassion, peace, humility, generosity, patience and the divine bliss that holds all human emotions. In this way, your personal consciousness (your soul) becomes a well-tuned instrument in the hands of God, sharing the fruit of enlightenment with everyOne, including yourself. So we see that being fully awake and being completely free leads to being entirely available for the sharing of the One Love of God, without any fear at all. You can read more in my 8-page essay: What Is Enlightenment? The core of what I talk about is truly ancient and yet what I offer feels fresh and new in many ways with significant differences from most of what is commonly found elsewhere. This is why I say that my teachings are unique and I will touch on some of those differences in just a minute. Perhaps my work will help you understand this delicious material in the deepest way possible and inspire us all to respect one another, treat each other kindly, and work together for both personal and world peace. By the way, my mentor is Timothy Conway, who truly embodies this open-hearted wisdom. Much of my work reflects what I have learn from his spiritual meetings, which I attended almost every week from June 2005 to July 2016, which was when Timothy and his wife Laura moved to Arizona. I am sure we will still keep in touch but for me, there was nothing quite like those weekly gatherings. I cherish them dearly. All my essays and excerpts are here. Your True Self Is the One Divine Awareness! My most passionate teaching offers you the idea that you exist in the most fundamental way as pure awareness, as the open capacity for experience. We have all heard it said that you are not a human being having a spiritual experience, but instead, you are a spiritual being having a human experience. While that shift in understanding is of course very important, there is still a deeper wisdom. In truth, you are not a being of any kind, physical or spiritual. You are pure awareness! And most importantly, this awareness is the Divine Awareness, the only reality that was not created. This Divine Awareness is the source of all of creation and it is the only witness to it. This is your true fundamental self and this Source-Awareness is looking out of your eyes right now! By “fundamental self,” I mean what you are when stripped of everything that is not essential to what you really are. Although you are fundamentally “only” pure, formless, transcendent Awareness, through the mystery of creation, you arise as the totality of created reality (all form) and you experience your life from the perspective of your own “personal self.” In this way, the One Self arises as all apparent selves. This is how the One becomes the many. The intuitive recognition of this is what creates tremendous love and compassion for everyOne. You are inspired to engage in life in a wholesome, unselfish way and to make the world a “better” place, as seen from the perspective of our ordinary world. The deep, intuitive recognition of your True Self is one of the core aspects of enlightenment. The other aspect is the ability to unselfishly flow in harmony with all that life brings forth. This book will help you become more skillful in the art of love and acceptance and in doing so, you will more easily experience a deep and lasting personal peace. Yet you were not created to just sit still in a state of peaceful acceptance. You are here to joyfully and fearlessly dive head first into your life in your own unique way. Many of us have heard the phrase “you create your own reality,” but this does not mean that the universe is your personal mail order catalog, simply waiting for you to clearly make up your mind and place your order. If you are open to a deeper understanding of that phrase, then you are ready to make some real progress. This is about removing blockages, not pursuing specific outer circumstances. When you release your limiting beliefs about yourself, the world, and how you fit into it, you will be free to put your values of kindness and compassion spontaneously into action with an aliveness that cannot be matched! So what do you think? 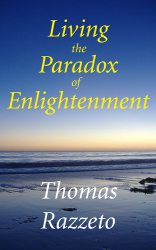 Are you inspired to learn more about the paradox of enlightenment? If so, this book just might offer you the clarity you have been looking for!